The opposition Sierra Leone People’s Party ( SLPP ) has been livid about the Schulenberg issue–The recent end to his tour of duty in Sierra Leone. The opposition quickly seized the bit and raised hell, accusing the Sierra Leone Government of being the one who declared Schulenberg persona non grata. Even when the UN denied and said they recalled Schulenberg, the SLPP still insisted that the government had a hand in Schulenberg’s recall. And last week, Reuters reported that a secret letter that Schuleng wrote the UN stating that President Koroma forced his recall had been leaked to them. This again was seized upon by the opposition and its supporters and they created a hulabaloo. But now , Schulenberg’s nature has been exposed by the FOREIGN CONFIDENTIAL magazine. The tell-all article even says that it was Schulenberg himself who leaked out his resignation letter to Reuters. The paper goes on to narrate that Schulenberg is not a stranger to controversy. A controversial United Nations official stationed in Sierra Leone who appears to have used his position to aid opposition figures ahead of national elections set for this November has left the country, cutting short his stay in the West African nation by a year. 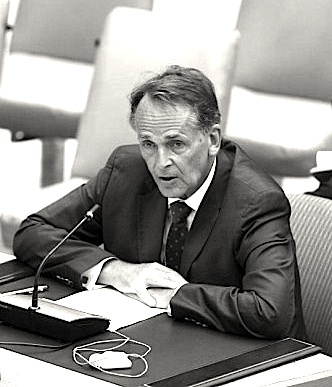 Moreover, in what may be an unprecedented action, the former envoy, Michael von der Schulenburg, asserted in a letter to UN headquarters that the organization’s credibility and Sierra Leone “success story” were threatened as a result of “unreasonable and unjustified demands” by the Sierra Leone Government for his early departure and “an effort to remove a potential obstacle [meaning himself] to … manipulating the election outcome” in favor of the incumbent President Ernest Bai Koroma. The existence of the letter came to light after it was leaked to Reuters, which published a story about the letter on Monday. The content and style of the story–click here to read it–somewhat resembles a news release rather than a news article, making Reuters look more like a public relations service than a press agency for disseminating the piece. The leaker’s identity has not been made public as of this writing. Both the UN and the Sierra Leone President have denied that von der Schulenburg was pushed out of his job. Click here for a relevant report. Elections in Sierra Leone this November come a decade after the end of an 11-year civil war that left over 50,000 dead. The conflict came to an end in 2002, after a British military intervention practically supplanted a weak and ineffective UN peacekeeping mission. Although UN troops withdrew from Sierra Leone in 2005, the world body retains a 200-person mission with a mandate to help ensure the forthcoming election is peaceful and credible. President Koroma will be challenged by an estimated 10 candidates, including his main opponent, a former military leader, Brigadier Julius Maada Bio. Foreign Confidential™ has learned that the number of meetings that von der Schulenburg held with Bio and other opposition figures was unusually high. Informed sources in Freetown say the envoy’s anti-Government bias was well known among expats and foreign diplomats. “He [von der Schulenburg] was most undiplomatic in the way he went about backing Bio,” a source says. The fact that the 24-page ”PERSONAL/CONFIDENTIAL” resignation letter has long been available online has fueled speculation that von der Schulenburg was responsible for leaking his Sierra Leone letter to Reuters. More recently, von der Schulenburg has been formally accused of physically abusing a staff member; and he has been dogged by persistent rumors that during an assignment in Iran he was noticeably sympathetic to the Islamist regime–whilst inappropriately exporting Persian carpets.